In late 2012 I was getting ready to make a sea-change. I was over the hustle an bustle of life in Melbourne and decided to make the move to the Sunshine Coast, having purchased my dream property. Part of the move entailed building a little golf farm, I’m a golf nut, having played most of my life and also written extensively about the game. My website, golfgooroo.com, has readers from all over the globe and many of these readers wanted golf lessons from me. So building a little coaching facility, with green and bunker, was part of the plan. Things got complicated from here. I’m keen on golf, but my enthusiasm for the game lies with playing and coaching. I have no idea about grass and completely clueless on the construction of a golf green – but I did think it would be easy. Ouch! There goes that idea. To build a proper golf green was going to be at least $20K and maintaining it would equal that every year. It just wasn’t a viable option and I’d be spending all my time looking after the thing. I needed a better option because mowing grass is not my idea of a good time. I hadn’t initially considered a synthetic green because the ones I had seen were terrible. They didn’t hold a shot and they were too fast. Word on the street was that synthetic greens were more for show than actual use. But I was desperate. A real putting green wasn’t an option and I really had my heart on having a usable putting green for my golf farm, I didn’t want to compromise here too much. I went to Google for help. 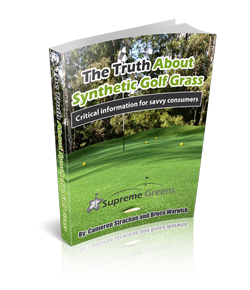 – are synthetic golf greens any good? – are these greens realistic to satisfy golf nuts like me? – are they maintenance free or do they require lots of work? – what sort of lifespan do they have? – who else has one I can speak with? NOTHING! There was virtually no valuable information available. Sure, the websites made all sorts of promises but they didn’t go into any detail and they weren’t offering enough information for a golfer. There were all sorts of photos but there wasn’t enough info for me to make a choice. If I wanted landscape lawn I’d be fine, but I wanted more. I needed to make an informed decision about a golf green that needed to look good and be playable. I didn’t want something that wasn’t realistic. I’m going to share with you all of the lessons I learned and how you can make an informed decision on your synthetic golf grass install. Ignore at your own risk. I’ve gone to serious lengths to learn about the synthetic green industry and specifically how their products relate to golf. Me: Hi mate, I’m looking at getting a golf green installed on the Sunshine Coast, can you give me some information please? Alan: Let me be honest with you, my brother Bruce is Australia’s leading person when it comes to synthetic golf grass, he’s a pioneer and he’s also located on the Sunshine Coast. I’m not going to waste any of your time, here’s his phone number, please call Bruce. That was that. I had a hot lead and I was away. Over the next few months I spent a lot of time with Bruce, learning all sorts of things about grass and discovering the secrets to getting a golf green that does what you want. I’m going to share with you the good, the bad and the ugly. There’s tips for saving money and making sure you get what you want. And just in case you’re wondering, I did manage to get the perfect golf green. 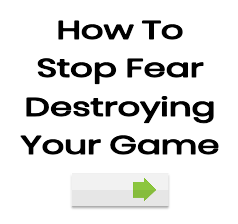 Click here to get the booklet.